If you’re looking to modify your new 2011+ Mustang 5.0, then you need to look no further than Ford Racing Performance Parts. The aftermarket division offers dozens of parts for Ford’s latest pony car including everything from superchargers to suspension systems to wheels to brake kits and everything in between. You can also upgrade your Mustang with many of the performance parts that come standard on the 2012-2013 Boss 302, choose from a variety of exhaust systems, or even swap out your engine for a new crate motor. Ford Racing has put together a list of 50 parts that you can currently buy from the FRPP catalog (which we’ve modified slightly), that you can browse through below. Ford Racing’s aluminum 5.0L Mustang Boss 302 crate engine takes the Ti-VCT 5.0L engine to the next level of performance with high flow CNC cylinder heads and revised intake to deliver 444 horsepower and 380 ft.-lb.+ of torque (with premium fuel). The lightweight aluminum cylinder block features cross-bolted main bearing caps and thick main bearing bulkheads for bottom-end strength. For the track, the oil pan features a large sump 8.5 qt capacity with revised oil pan baffling for improved oil control under hard cornering. Ford Racing’s aluminum 5.0L Mustang Boss 302R crate engine is a modern 5.0L 32-valve DOHC V-8 that uses advanced features like Twin Independent Variable Camshaft Timing (Ti-VCT) and high flow CNC cylinder heads to deliver 444 horsepower and 380 ft.-lb.+ of torque (with premium fuel). Upgraded engine harness with motorsport connectors on the (4) VCT Solenoids, (4) Cam position sensors, and the crank position sensor. Boss 302R crate engine shown with optional Ford blue coil pack covers FRPP part # : M-6P067-M50B and NVH insulator pads, Ford dealer part # :CR3Z-6N041-A. sold separately. Ford Racing’s 5.0L Mustang “Aluminator” crate engine is a modern 5.0L 32-valve DOHC V-8 that uses advanced features like Twin Independent Variable Camshaft Timing (Ti-VCT) to deliver big power. Unlike the factory 5.0L engine, the “Aluminator” is built with low compression forged pistons and H-beam connecting rods to meet the demands of forced induction. Vehicle harness and PCM not included. Use Ford Racing wiring, PCM and installation kit M-6017-A504V designed for street rod/project car installation. Fits 2011-2012 Mustang GT with MANUAL transmission. Ford Racing”s tuner kit does not include Ford Racing”s ProCal calibration, custom PCM calibration is required. Boss 302 Intake Manifold Install Kit, Part No. M-9444-M50B is recommended and includes the necessary production components to complete the installation. Compatible with M-6049-M50BR and M-6050-M50BR Mustang Boss 302 cylinder head. Clamp on installation – does not require welding! The 8.8″ rear end has been the standard in performance since its introduction in the Mustang in 1986 and Ford Racing is the manufacturer of choice when it’s time to hop-up your axle. OEM quality – our superior surface finish, hardening, and manufacturing consistency provide the strongest and quietest 8.8″ gears in the market! These are the same units that have 100,000 mile warranties in our production cars. Higher quality gears means more satisfied customers! Race Proven – Ford Racing 8.8″ gears are the choice of championship road racing and drag racing teams including Multimatic Motorsports and Kurgan Motorsports. Make your 2005-2012 Mustang GT a corner-carving machine with the added performance of the adjustable FR3 handling pack. The adjustable struts/shocks allow you to tune your suspension to street or track conditions. One click using the supplied tool adjusts for both compression and rebound. Fits 2011-2012 Mustang GT Coupe when used with M-18183-C upper strut mounts and M-18000-A Dampers. Fits 2005 – 2012 Mustang. Includes front and rear jounce stops. Requires 18″ M-1007-DC1895, M-1007-S1895, M-1007-S1895B1 or 19″ M-1007-DC199B, M-1007-SA199 or M-1007-DC199LGB Ford Racing wheel or equivalent for caliper clearance. Similar to OEM seat found in the 2012 Mustang Boss 302 Laguna Seca, this seat is equipped with an integrated headrest, seat belt pass through openings and enhanced bolstered shoulder, back and thigh areas. 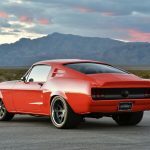 This entry was written by by MustangsDaily (Mustangs Daily) and posted here on Thursday, February 16th, 2012 at 7:02 pm and is filed under Buyers Guides, ford racing, ford racing mustang parts, ford racing performance parts, frpp. This article was not written by us, rather gathered using RSS feeds listed here. We take no credit for this article. You can leave a response, or trackback from your own site. for choosing a manufacturer of printed circuit boards, right now.